The Reverse Osmosis Process is the removal of up to 99.9% of undesirable water contaminants by forcing untreated water through a semi-permeable membrane. Pressure forces the water to flow in the reverse direction to the direction of flow in natural osmosis. Unlike general purpose water filters, once the reverse osmosis systems forces the water through, it separates the contaminated water from the filtered water. 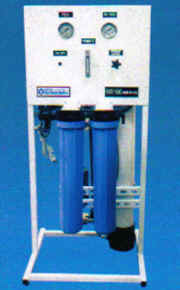 The reverse osmosis filters are build with a drain mechanism that allows the system to drain contaminated water and keep the filtered water in a storage tank. 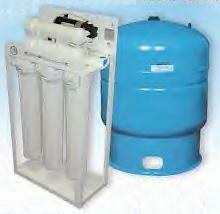 This mechanism prevent contaminants like bacteria and inorganic chemical from being attached to the filters. The reverse osmosis flush them out. Introducing the new LC Series Light Commercial Reverse Osmosis System. Small in size, but big in capacity! 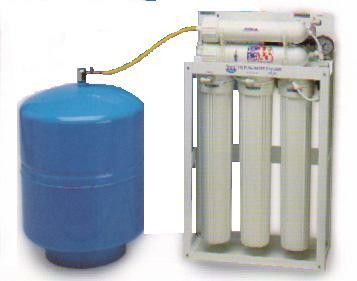 Capable of producing up to 500 gallons per day this commercial reverse osmosis system with 4 stage filtration is suitable for the more exigent commercial application. From 500 to 6000 gallons per days, this commercial - industrial free standing reverse osmosis units can produce enough water for high demanding applications.